L.C. Smith, V. W. Chu, Y. Kang, C. J. Gleeson, L. H. Pitcher, A. K. Rennermalm, C. J. Legleiter, A. E. Behar, B. T. Overstreet, S. E. Moustafa, M. Tedesco, R. R. Forster, A. L. LeWinter, D. C. Finnegan, Y. Sheng, J. Balog. Efficient Meltwater Drainage through Supraglacial Streams and Rivers on the Southwest Greenland Ice Sheet. Proceedings of the National Academies of Sciences 112(4), 1001-1006, doi: 10.1073/pnas.1413024112. A. K. Rennermalm, L. C. Smith, V. W. Chu, S. E. Moustafa, L. Pitcher, C. Gleason. Proglacial River Dataset from the Akuliarusiarsuup Kuua River Northern Tributary, Southwest Greenland, 2008 - 2013, version 2.0. PANGEA. J. R. Mioduszewski, A. K. Rennermalm, D. A. Robinson, T. L. Mote. Attribution of Snow Melt Onset in Northern Canada. Journal of Geophysical Research - Atmospheres 119, 9638–9653, doi: 10.1002/2013JD021024. A. K. Rennermalm. Insight: Greenland Ice Loss Speeds Ahead. Environmental Research Web 22 April, 2013. M. Tedesco, J. E. Box, J. Cappelen, X. Fettweis, T. Jensen, T. L. Mote, A. K. Rennermalm, L. C. Smith, R. S. W. van de Wal, J. Wahr. The Arctic: Greenland Ice Sheet in “State of the Climate 2013.” Bulletin of the American Meteorological Society, 95(7), S136-S137, doi:10.1175/2014BAMSStateoftheClimate.1, 2014. Understanding Greenland Ice Sheet Hydrology Using an Integrated Multi-scale Approach. A. K. Rennermalm, S. E. Moustafa, J. R. Mioduszewski. Understanding Greenland Ice Sheet Hydrology Using an Integrated Multi-scale Approach. Environmental Research Letters 8(1), 015017, 14pp, doi:10.1088/1748-9326/8/1, 2013. A. K. Rennermalm, L. C. Smith, V. W. Chu, J. E. Box, R. R. Forster, M. van den Broeke, D. van As, S. E. Moustafa. Evidence of Meltwater Retention within the Greenland Ice Sheet. The Cryosphere 7(5), 1433-1445, doi:10.5194/tc-7-1433-2013, 2013. A. K. Rennermalm, A. Bring, T. L. Mote. Spatial and Scale Dependent Controls on North American Pan-arctic Minimum River Discharge. Geographical Analysis 44(3), 202-218, doi:10.1111/j.1538-4632.2012.00849.x, 2012. A. K. Rennermalm, J. R. Mioduszewski, S. E. Moustafa. Breaking the Ice: Theorizing the Mechanisms of Arctic Thaw. Eos, Transactions American Geophysical Union 93(42), 416, doi:10.1029/2012EO420006, 2012. A. K. Rennermalm, L. C. Smith, V. W. Chu, R. R. Forster, J. E. Box, B. Hagedorn. Proglacial River Dataset from the Akuliarusiarsuup Kuua River Northern Tributary, Southwest Greenland, 2008 - 2010, Version 1.0. PANGEA, doi:10.1594/PANGAEA.762818, 2012. A. K. Rennermalm, L. C. Smith, V. W. Chu, R. R. Forster, J. E. Box, B. Hagedorn. Proglacial River Dataset from the Akuliarusiarsuup Kuua River Northern Tributary, Southwest Greenland, 2008–2010. Earth System Science Data 4(1), 1-12, doi:10.5194/essd-4-1-2012, 2012. V. W. Chu, L. C. Smith, A. K. Rennermalm, R. R. Forster, J. E. Box. Hydrologic Controls on Coastal Suspended Sediment Plumes around the Greenland Ice Sheet. The Cryosphere 6(1), 1-19, doi:10.5194/tc-6-1-2012, 2012. A. K. Rennermalm, J. M. Nordbotten, E. F. Wood. Hydrologic Variability and its Influence on Long-term Peat Dynamics. Water Resources Research 46, W12546, 18pp, doi:10.1029/2009WR008242, 2010. A. K. Rennermalm, E. F. Wood, T. J. Troy. Observed Changes in Pan-arctic Cold-season Minimum Monthly River Discharge. Climate Dynamics 35(6), 923-939, doi:10.1007/s00382-009-0730-5, 2010. V. W. Chu, L. C. Smith, A. K. Rennermalm, R. R. Forster, J. E. Box, N. Reeh. Sediment Plume Response to Surface Melting and Supraglacial Lake Drainages on the Greenland Ice Sheet. Journal of Glaciology 55(194), 1072-1082, 2009. Does Sea Ice Influence Greenland Ice Sheet Surface-melt? A. K. Rennermalm, L. C. Smith, J. C. Stroeve, V. W. Chu. Does Sea Ice Influence Greenland Ice Sheet Surface-melt? Environmental Research Letters 4(2), 024011, 6pp, doi: 10.1088/1748-9326/4/2/024011, 2009. L. Grondahl, T. Friborg, T. R. Christensen, A. Ekberg, B. Elberling, L. Illeris, C. Nordstroem, A. K. Rennermalm, C. Sigsgaard, H. Sogaard. Spatial and Inter-annual Variability of Trace Gas Fluxes in a Heterogeneous High-Arctic Landscape. Advances in Ecological Research 40, 473-498, 2008. A. K. Rennermalm, E. F. Wood, A. J. Weaver, M. Eby, S. J. Dery. Relative Sensitivity of the Atlantic Meridional Overturning Circulation to River Discharge into Hudson Bay and the Arctic Ocean. Journal of Geophysical Research: Biogeoscience 112(G4), G04S48, 12pp, doi:10.1029/2006JG000330, 2007. A. K. Rennermalm, E. F. Wood, S. J. Dery, A. J. Weaver, M. Eby. 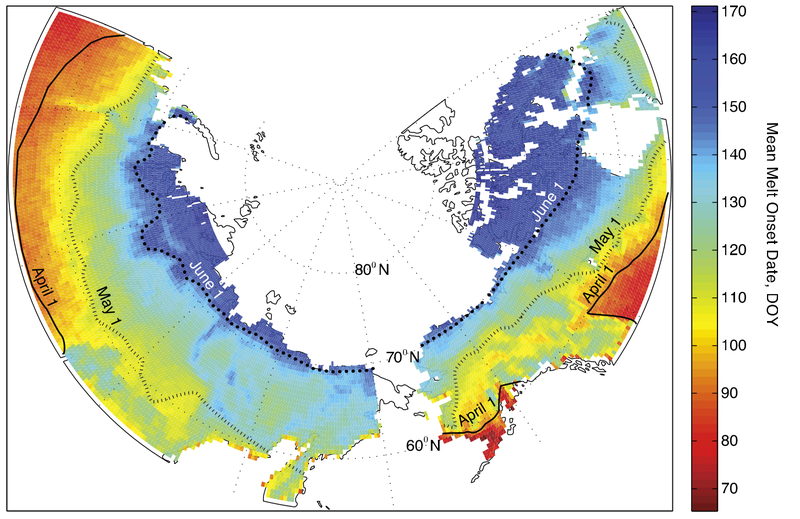 Sensitivity of the Thermohaline Circulation to Arctic Ocean Runoff. Geophysical Research Letters 33(12), L12703, 4pp, doi:10.1029/2006GL026124, 2006. A. K. Rennermalm, H. S. Soegaard, C. N. Nordstroem. Interannual Variability in Carbon Dioxide Flux from a High Arctic Fen Estimated by Measurements and Modeling. Arctic, Antarctic and Alpine Research 37(4), 545-556, 2005. S. J. Dery, M. Steiglitz, A. K. Rennermalm, E. F. Wood. The Water Budget of the Kuparuk River Basin. Journal of Hydrometeorology 6(5), 633-655, doi:10.1175/JHM434.1, 2005.